If you are in Las Vegas and are considering a trip to the Grand Canyon, you'll want some basic information to help you plan your trip. If a trip to Las Vegas is your only opportunity to visit Arizona's Grand Canyon, you'll want to seriously consider a day trip. When you stand on the rim of the Grand Canyon and look out at the horizon you'll be amazed at how deep the canyon is and how beautifully the light plays on the canyon walls. It's no wonder the Grand Canyon is such a popular attraction for people visiting Las Vegas and rightfully so, it's a natural wonder that should be on your bucket list. 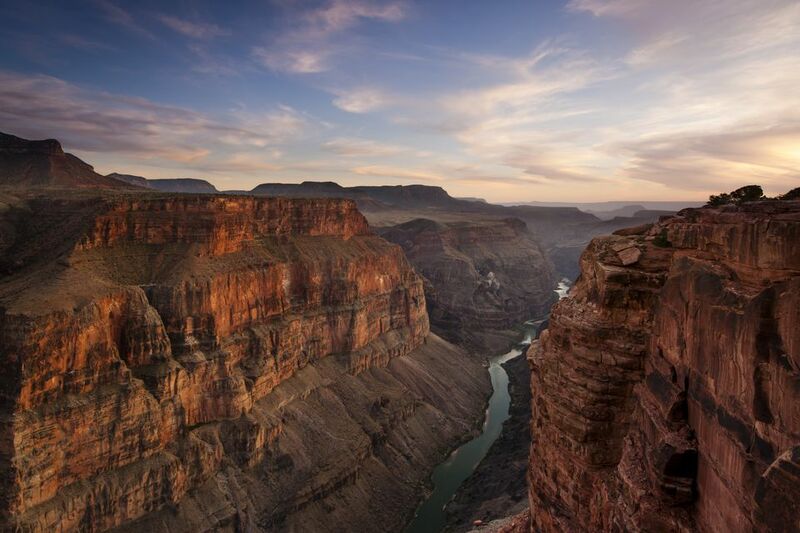 The Grand Canyon is visited by approximately 5 million people each year. The park consists of 277 miles of the Colorado River and its massive erosional effects on the surrounding landscape. The Grand Canyon can be enjoyed from either the south or the north rims. Tours to the Grand Canyon take place in all seasons. Check the weather in Las Vegas first and then you'll get a better idea of when to go. Winter in the Grand Canyon is impressive. If you are lucky enough to be there when snow has fallen you'll get a dramatic view of the red rocks of the canyon contrasted with the bright white snow. Summer in the Grand Canyon brings more visitors from around the world and, of course, can get hot for hikers. Fly over the Grand Canyon and you'll get a good idea of just how massive the space between the edges is. Hike or take a mule trip down into the canyon and you will be baffled by just how much time it will take you to get back to the top. Weathering, erosion and the passage of time has made this area of the desert in Arizona such an impressive sight that it will be difficult for you to comprehend that this was flat land over 2 billion years ago. Fortunately, it's not that difficult to get to from Las Vegas. Your options vary from bus and helicopter rides to motorcycle and small planes. Of course, you can also rent a car and drive yourself. Prices vary with the type of tour you take. Check TripAdvisor for deals on Grand Canyon Tours from Las Vegas. The views as you hover high above the canyon floor are adrenaline pumping. You'll be traveling along the treetops with the rim of the Grand Canyon at eye level. All of a sudden you'll be over the edge of the canyon looking down in the depths toward the Colorado River. You'll travel effortlessly over to see the north side of the canyon and back. It's an unforgettable ride. As you fly, you'll be wearing headphones so the chop of the rotors won't be audible. You can concentrate on the sights and snapping photos as the helicopter turns and banks for the best views. Some helicopter tours offer a CD of the trip for purchase when you land. Papillon Helicopters runs tours of the Grand Canyon as does Maverick Helicopters. You'll be able to depart from Las Vegas. You'll fly directly to the airport in the Grand Canyon from either Las Vegas airport or from the Boulder City Airport. Either way, the trip is significantly shorter than driving to the national park. You can also take a tour and see the sights from the air. Pappillon, for an example, offers a Las Vegas to Grand Canyon flightseeing tour which includes the 65-minute fixed wing flight over Hoover Dam, Lake Mead, and the Mojave Desert. A motorcoach transfer from the airport includes stops at Bright Angel Lodge and Mather Point, both offering fantastic canyon vistas. A Box lunch and time for short hikes and exploring the canyon rim takes most of the day. The bus picks up guests and it's back to the airport for the flight back to Las Vegas. One motorcycle tour involves flying to the canyon airport and riding a motorcycle to see the canyon. Guests thrill at the thought of riding a Harley in such a scenic place. You can choose between riding alone or with a guide. As long as you have a drivers' license you can rent a motorcycle. You'll be concentrating more on excitement of the ride than the scenery as you keep your thoughts on the road before you but you'll be out in the open and able to smell the sweetness of the pine trees in the warm sun. There are places to pull over and have a little snack and enjoy the view so you'll still get to enjoy the Grand Canyon scenery. This experience is not for everybody but it is a great way to immerse yourself in the Grand Canyon experience. Eagle Rider rents motorcycles at the canyon and in other Arizona locations. The views of the desert landscape are fabulous. Southern Nevada and Northern Arizona are quite arid so your highlights might be Lake Mead and the Hoover Dam. If you decide to drive consider making it a two-day trip so you have enough time to recharge before driving back to Las Vegas. In the summer, carry plenty of water and in the winter make sure you have warm clothing. It may sound like common sense but plenty of visitors don't always think the desert can get cold. The Grand Canyon is located about 250 miles from the Las Vegas strip. Taking highway 93 south from Las Vegas to Interstate 40 east to Highway 64. The trip takes about 4 1/2 hours and on the way, you'll take the bypass bridge with a view of Hoover Dam. Time permitting you may want to take a detour to tour the dam. When you get to the South Rim, visit Grand Canyon Village to get oriented with the National Park. The visitors center is located in the village and offers lectures, videos, and rangers to assist you. From the Village, some get on the Bright Angel Trail to the bottom of the canyon. It's a good 9 miles to the bottom and not for everyone. However, after a visit to the visitors center, you will get information on easier, less strenuous hikes and trails that work for most visitors. You will also get information on spectacular lookout locations and seasonal activities around the National Park. You can choose a Grand Canyon South Rim Bus Tour and let someone else do the driving. The comfort level is higher than if you drive yourself and you can recuperate from your previous evening's partying in Las Vegas. A typical tour includes stops at the National Geographic Visitors Center as well as two spectacular lookouts, Mather Point and Bright Angel Lodge. Take a hike along the various trails to lookouts such as Mather Point and visit the historic El Tovar Lodge. When you are in Las Vegas you'll see a number of tours that travel to Grand Canyon West, not the Grand Canyon National Park. There is a difference and it is wise to check the wording on the tour site carefully. It's important to know that the location is not near the Grand Canyon National Park South Rim or North Rim. It on another part of the Colorado River and it is a beautiful area. Grand Canyon West, owned by the Hualapai Tribe, is where the Skywalk is. The Skywalk and the tourist facilities at Grand Canyon West represent the dreams of the Tribe for a financially secure future. They have their own airstrip and you can take a helicopter, plane or bus tour there. They have overnight facilities and, of course, the opportunity to walk out over the canyon on the see-through Skywalk. But if seeing "THE Grand Canyon" is on your bucket list, you may want to ensure that you are actually visiting the South Rim of the Grand Canyon National Park before you sign up for the tour out of Las Vegas. What Does Your Las Vegas Bucket List Look Like?